AI is one of the newest fields in science and engineering. Work started in earnest soon after World War II, and the name itself was coined in 1956. Along with molecular biology, AI is regularly cited as the “field I would most like to be in” by scientists in other disciplines. A student in physics might reasonably feel that all the good ideas have already been taken by Galileo, Newton, Einstein, and the rest. AI, on the other hand, still has openings for several full-time Einsteins and Edisons. AI currently encompasses a huge variety of subfields, ranging from the general (learning and perception) to the specific, such as playing chess, proving mathematical theorems, writing poetry, driving a car on a crowded street, and diagnosing diseases. AI is relevant to any intellectual task; it is truly a universal field. We’ll see eight definitions of AI, laid out along two dimensions. These definitions are concerned with thought processes, reasoning and behavior. Of these some definitions on the left measure success in terms of fidelity to human performance, whereas some measure against an ideal performance measure, called rationality. 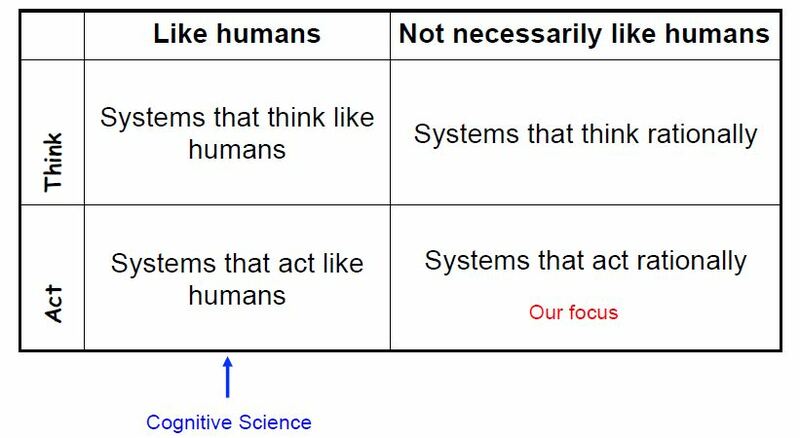 A system is rational if it does the “right thing,” given what it knows. Historically, all four approaches to AI have been followed, each by different people with different methods. A human-centered approach must be in part an empirical science, involving observations and hypotheses about human behavior. A rationalist approach involves a combination of mathematics and engineering. The various group have both disparaged and helped each other. Let us look at the four approaches in more detail. Artificial Intelligence (AI) is a branch of Science which deals with helping machines find solutions to complex problems in a more human-like fashion. This generally involves borrowing characteristics from human intelligence, and applying them as algorithms in a computer friendly way. A more or less flexible or efficient approach can be taken depending on the requirements established, which influences how artificial the intelligent behavior appears. Artificial intelligence can be viewed from a variety of perspectives. From the perspective of intelligence artificial intelligence is making machines “intelligent” — acting as we would expect people to act. The inability to distinguish computer responses from human responses is called the Turing test. From a business perspective AI is a set of very powerful tools, and methodologies for using those tools to solve business problems. From a programming perspective, AI includes the study of symbolic programming, problem solving, and search. Typically AI programs focus on symbols rather than numeric processing. Problem solving – achieve goals. Search – seldom access a solution directly. Search may include a variety of techniques. – LISP, developed in the 1950s, is the early programming language strongly associated with AI. LISP is a functional programming language with procedural extensions. LISP (LISt Processor) was specifically designed for processing heterogeneous lists — typically a list of symbols. Features of LISP are run- time type checking, higher order functions (functions that have other functions as parameters), automatic memory management (garbage collection) and an interactive environment. – The second language strongly associated with AI is PROLOG. PROLOG was developed in the 1970s. PROLOG is based on first order logic. PROLOG is declarative in nature and has facilities for explicitly limiting the search space. – Object-oriented languages are a class of languages more recently used for AI programming. Important features of object-oriented languages include: concepts of objects and messages, objects bundle data and methods for manipulating the data, sender specifies what is to be done receiver decides how to do it, inheritance (object hierarchy where objects inherit the attributes of the more general class of objects). Examples of object-oriented languages are Smalltalk, Objective C, C++. Object oriented extensions to LISP (CLOS – Common LISP Object System) and PROLOG (L&O – Logic & Objects) are also used. Artificial Intelligence is a new electronic machine that stores large amount of information and process it at very high speed. The computer is interrogated by a human via a teletype It passes if the human cannot tell if there is a computer or human at the other end. The ability to solve problems. It is the science and engineering of making intelligent machines, especially intelligent computer programs.